From reading the news, you'd think retail is a dying industry. But the only newcomer to this year's Richest In State list, Frank VanderSloot of Idaho, hails from that very sector. VanderSloot built his $1.9 billion fortune from his retailer Melaleuca, which sells vitamins, supplements and eco-friendly cleaning products. VanderSloot is one of 8 retail billionaires on the list this year. 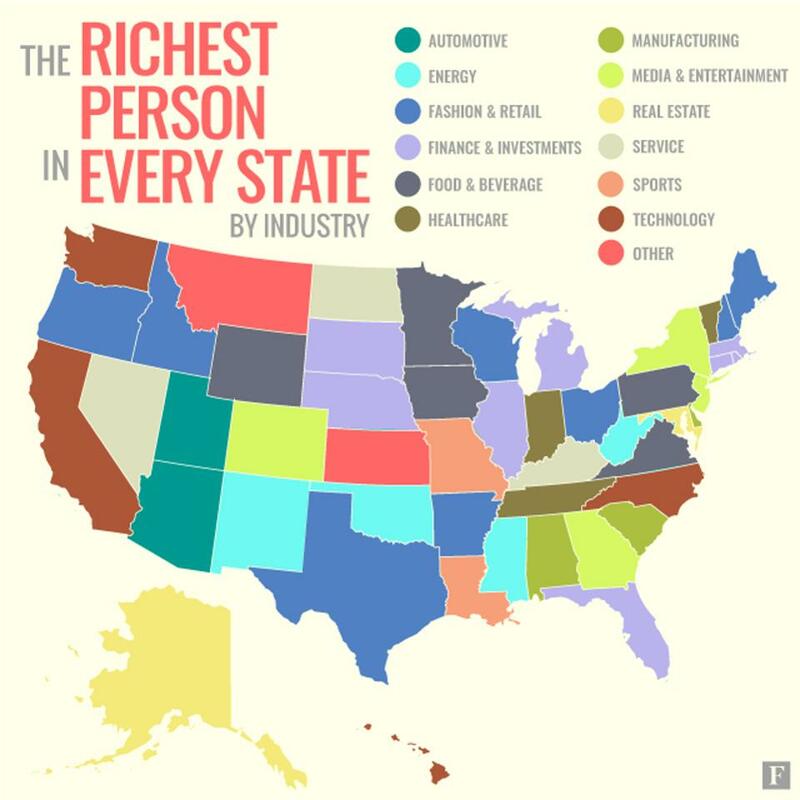 For the third year running, Forbes has tallied up the wealth of the richest person in every state in the U.S. This time, we counted 52 people (Alaska and Delaware had ties) who built their fortunes in 16 different industries, from sports (Louisiana and Missouri) to automotive (Arizona and Utah). But nearly one third of people on the list derive their fortunes from just two industries: fashion and retail and finance and investments. Eight billionaires made fortunes in finance and eight in retail. Other state-topping retail billionaires include Wal-Mart heirs Alice Walton (Texas) and Jim Walton (Arkansas) whose fortunes have continued to grow in the last year. Alice's net worth is up $4.9 billion to $33.3 billion, and Jim is up $4 billion to $34.5 billion. Wisconsin's richest, Menards founder John Menard Jr., is up $300 million to $10.6 billion. And even though Nike founder Phil Knight's net worth stayed flat at $25.1 billion over the last year, he still managed to hold onto his title of richest person in Oregon. While retail and finance are the most common sources of wealth for list members, the billionaires who have made their fortunes in technology have by far the most wealth. The four billionaires from California, Hawaii, North Carolina and Washington who hail from the tech sector have a combined net worth of $170.3 billion. This includes Washington's (and the world's) richest person Bill Gates, who has a $88.9 billion net worth, and California's richest, Mark Zuckerberg, who's worth $62.4 billion. Wealth built by list members in finance comes in second. Including the Oracle of Omaha himself, Warren Buffett, with a net worth of $76.2 billion, those 8 billionaires have a combined net worth of $139.1 billion. A smaller number of people have made their fortunes in real estate. Maryland's richest, real estate developer Ted Lerner, has a net worth of $5.8 billion. Meanwhile, Alaska's two richest people, Leonard Hyde and Jonathan Rubini, who together control much of the Anchorage skyline, each have a $340 million net worth. Contact www.SoCalLifeRealtors for all your real estate needs!